Lynn blends warmth, fun and encouragement with high technical expectations. 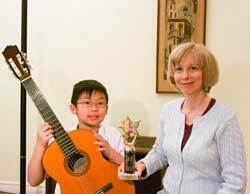 Her guitar students won 1st prizes in all categories entered in the 2014 North York Arts Festival, prompting director Ella Poret to award trophies to the “Best Junior Guitarist” to Nicolas Lee and “Best in Guitar” to Jessica Gu. Jessica also won the provincial RCM Gold Medal for her grade 6 guitar examination. Past winners include Kevin Gai (2013) “Best Senior Guitarist” in the NYMF and 1st place for string ensemble performance in the Kiwanis Music Festival (Vivaldi Concerto in D+). Kevin was accepted into the University of Ottawa and University of Western, however accepted a scholarship to Wilfred Laurier. Helen Lu won the CMC competition for guitar in the under 16 category, culminating in a beautiful performance of Rodrigo’s Aranjuez Concerto (Adagio). Mr Dobby is on the Guitar Faculty of the Schulich School of Music of McGill University, where he has been teaching, classical guitar, for the past ten years. He began guitar studies at age 10 at the McGill Conservatory with Nick Di Tomaso. In California, he studied with the famous guitarists Pepe Romero, James Smith, and with LA Guitar Quartet members Scott Tennant and Bill Kanengiser. The performance focused Artist Diploma at McGill was under the supervision of Dr. Garry Antonio. 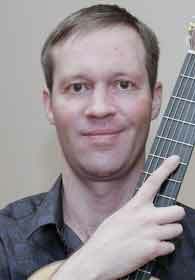 Tim was lead guitarist in an indie folk-rock band called Lakes of Canada. He enjoys teaching children through adults, both popular and classical. He strives to pass on his passion and the fun of playing the guitar. Guitar lessons $26 to $32.50 per half hour for private guitar lessons. *Select Lessons at Don Mills and McNicoll Ave.
For guitar lessons, I recommend that students purchase a reliable, but inexpensive Beaver Creek or Yamaha guitar available in 1/2, 3/4 and full size selected by the teacher. Though less known, the Beaver Creek has a solid Spruce Top and produces a vibrant tone. These nylon string guitars are easier on the fingers for beginners. Guitar students will be able to perform adequately to pass lower levels of RCMusic guitar examinations without a large investment. Children may begin guitar lessons at age 5-7, with the help and supervision of a parent. When moving through RCMusic guitar examinations, parents need to increase guitar lesson duration for favorable results. Exams require ear training/sight reading and technical requirements which become progressively more difficult. Students will not progress without adequate lesson time. If economic resources are tight, choose a strict, but inspirational teacher and ensure adequate lesson duration before investing in an expensive instrument. There is no way to make up lost years spent acquiring poor technique. Similarly, a remarkable teacher cannot accomplish everything in 30/45 minute lessons. As guitar students pass through the graded levels, more is expected in terms of dynamic range and tone (sound quality). The inexpensive guitars are not acceptable for serious musicianship. Beautiful tone and expressive dynamics are achieved with a solid wood guitar such as the Alhambra 7PA or the Alhambra 9 Senorita for small hands now available through Ware Academy. If the guitar back and sides are made of laminate, that lowers the quality and value of the guitar substantially. 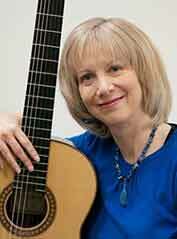 Please speak with Lynn to purchase a suitable guitar. Congratulations Guitar Student Nicolas Lee! "Best Intermediate Guitarist" trophy. His teacher Lynn Ware had two winers in the North Yourk Music Festival. Kevin Gai won "Best Senior Guitarist" at North Yourk Music Festival. Congratulations Kevin! “Acoustic” refers to pick style melody playing, while “classic” refers to the use of right hand thumb and fingers to integrate a melody with a supporting bass. I recommend that young students blend a few acoustic style melodies within a classic approach. Beginning Guitar Student Playing Classical Style . The classic approach allows beginning guitar students to enter the RCMusic system of graded levels with certificates and diplomas. Even guitar students who begin lessons “just for fun” will appreciate a nylon string guitar which is easier for the left hand and has a smaller body. The student will have the option to switch musical styles without purchasing another guitar. Both methods explore note reading, rhythm, meter and chords. One year of guitar lessons is required for sight reading. Guitar Student Helen Lu, wins 1st Prize in National, Canadian Music Competition 16 and under.